Each visit to the National Watercolor Society unearths unexpected gems. Brilliant jewel-toned paintings hang beside the somber image of a priest kneeling in prayer. The aged, grizzled face of a homeless man hangs on a wall just around the corner from a jolly Santa. The 97th International Exhibition is a particularly beautiful show consisting of works from masters in the field of watercolor. Twice each year artists from across the country and around the world gather to exhibit their work. Each spring, members gather for their own exhibit. The current international exhibition is a juried competition featuring 94 paintings; 29 artists and $43,000 worth of prizes. Watercolor has been around since painting began but didn’t really take off until the Renaissance. The German printmaker, Albrecht Dürer, was an early practitioner and found the medium ideal for small, detailed studies. Artists continue to lean towards landscapes and still life, but many have moved far beyond. This year’s grand prize winner is Massachusetts artist Carolyn Latanision. 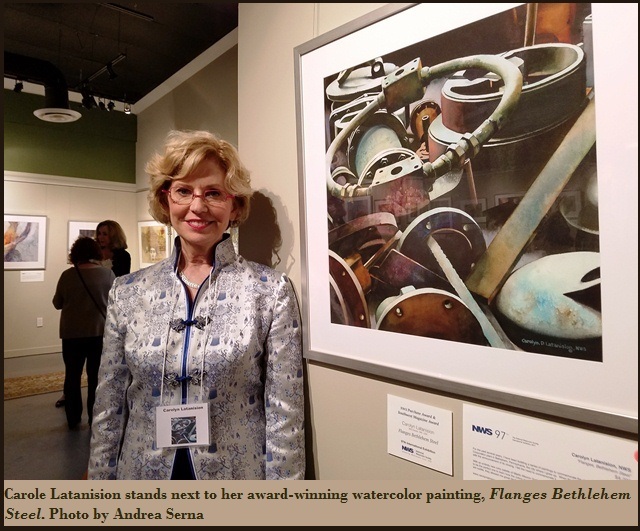 Her award-winning painting is titled Flanges Bethlehem Steel and her work is a perfect example of the acceptance of more industrial subjects in the field of watercolor. Latanision was raised in Pennsylvania in the shadow of a steel plant. Her series Bethlehem Steel reflects an intimacy with the furnaces and smokestacks at the foundry. The curvilinear shapes of her painting exalt the mundane to the extraordinary. In her winning piece, flanges sit stacked in the factory, waiting for work that has since moved overseas. After more than a century leading the steel industry, Bethlehem was dissolved in 2001. After receiving her bachelor of science in art education, Latanision moved away from Pennsylvania. She lives in Boston and continues her education at the Art Institute of Boston. Her work is highly lauded and is in prominent collections in New England. People and architecture are prominent in Latanision’s work; in both cases, urban scenes are frequently depicted. The strength and style of buildings, the abstract patterns of light and dark in her work juxtaposed with people and architecture, and the connections they create, make a statement about the complexities of our time. The National Watercolor Society has been in San Pedro since 1999 and this exhibition reflects the time and work it takes to gather artists of this caliber for the competition. 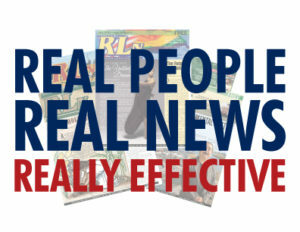 Many of the artists have established prominent reputations and there are very few emerging artists represented. The society showcases and supports the development in watercolor media from traditional to experimental.